Tomorrow, “Dolphin Tale 2” opens in movie theaters, starring dolphins Winter and Hope. 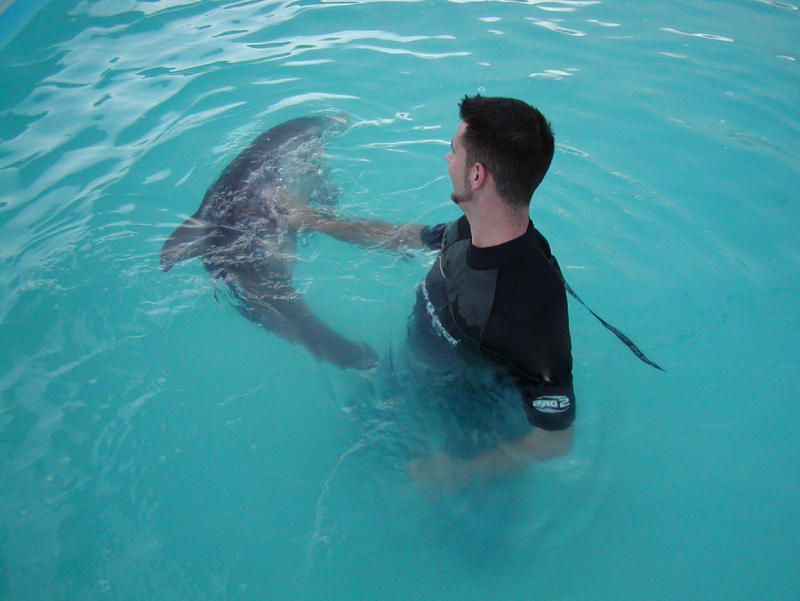 I was a volunteer at the Clearwater Marine Aquarium when Winter stranded, and helped with her care for a little while. Here’s a piece I wrote in 2010 for a local magazine about my experience. It is dark and cold in December 2005…well, cold for Florida. I shimmy my way into the wetsuit – always a good feeling – zipping up the back, making sure that I would keep warm in the holding tank. The water wasn’t heated. And why should it be? It wasn’t for my comfort, after all. I let myself down the ladder and into the waist-deep water. The holding tank is about 12 feet in diameter, and another volunteer is slowly walking the parameter. I saddle up to her and take over, lowering my hands beneath the surface and gently lifting up. This is my first introduction to Winter, the Atlantic Bottlenose dolphin who arrived at the Clearwater Marine Aquarium without a tail. 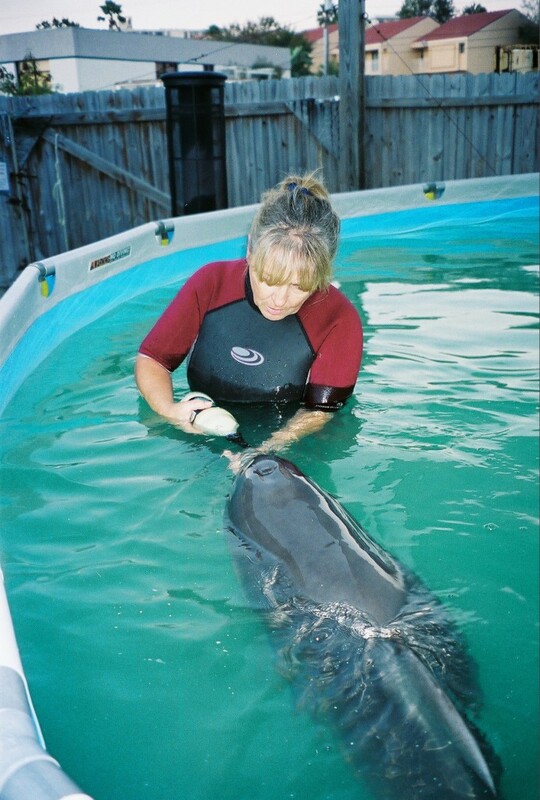 When she first arrived, Winter had to be helped around the tank so that she’d stay afloat to breathe. For the next hour or so I slowly walk with Winter, making sure to support her and keep her in constant motion, with her blowhole above the water’s surface for ease of breathing. My left hand is beneath her belly, firmly holding her up, while my right hand gently strokes underneath her beak, or rostrum. Though I know she can’t understand, I softly talk to her, trying to sooth her nerves, which in my mind must be shot, what with her in unusual surroundings, not to mention in the company of humans. We round the tank again and again, me and this wild animal who is, quite literally, in my hands for the time being. As a calf, Winter had to be bottle fed when she arrived at the aquarium. When she came to the Clearwater Marine Aquarium in December 2005, Winter was just three months old, confused and fighting for her life. She had several life-threatening bodily injuries as a result of being entangled in a crab trap off the east coast of Florida, and was transported to the aquarium for intensive care and, everyone hoped, rehabilitation. With around-the-clock attention and ground-breaking treatments from the aquarium’s staff, volunteers and international parties, today Winter is a dolphin who is thriving and bringing smiles to millions around the world. A cut on Winter’s mouth, when she first arrived at the aquarium. But it wasn’t an easy two years. 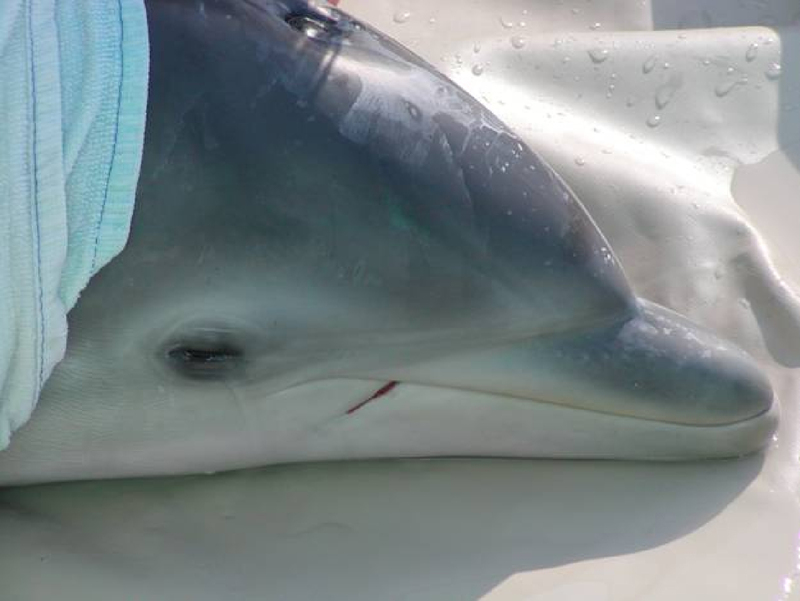 In addition to deep wounds on both sides of her mouth and tongue, underneath both of her pectoral fins and her peduncle (tail), Winter was very thin and dehydrated, and had problems eating. As most of her wounds healed over time, the result of the extensive damage to her peduncle resulted in the loss of her tail. She did, however, adjust to losing her tail and learned to swim side to side, propelling her forward. Last year, Winter and the Clearwater Marine Aquarium made national and international headlines as she fought to survive. Her story was featured on ‘The Today Show’ on NBC, CNN and the BBC, as well as many newspapers throughout the world. Most recently, ‘The Today Show’ aired a follow-up story regarding Winter’s progress. “She’s doing amazingly well and is completely healthy,” said David Yates, CEO, Clearwater Marine Aquarium. The staff at Clearwater Marine Aquarium has worked extensively with a team of experts to develop a prosthetic tail for Winter. The consortium consists of Clearwater Marine Aquarium and Hanger Orthopedic Group, Inc., and will be advised by Mike Walsh, DVM, former Director of Veterinary Services at SeaWorld; Steve McColluch, Director of Dolphin Research and Conservation at Harbor Branch Oceanographic Institution; and Juli D. Goldstein, DVM and marine mammal specialist. The team has spent the past several months conducting high-tech laboratory research and developing models of what the tail will, well, entail. A 3-D digital scan of Winter’s tail was taken, essentially providing a type of typographical map of her tail, and from that scan the models are developed. At the first of June, Hanger Orthopedic Group, out of Bethesda, Md., presented a second version of the model tail for the entire team to review. Throughout the process, Winter is gradually being introduced to what will be a new part of her so that she doesn’t reject the tail once it is in place. To help acclimate her, caretakers are wrapping the material that will be used on the tail around her body so that she will become familiar with the feel. Over the course of her life, Winter will need up to five prosthetic tails to keep up with her growing spurts. Though it may take months or even years for a final prosthetic tail to become a reality, the team is dedicated to seeing the project through and bettering Winter’s life. In the meantime, she continues to thrive with Panama, a 30-year-old female dolphin, at the aquarium. Though she wasn’t expected to survive, Winter continues to fight on, defying the odds and surviving her seemingly insurmountable obstacles. Two years ago I had a chance to be a part of her life and took away a gentle, friendly reminder that all of us can survive anything if we try. 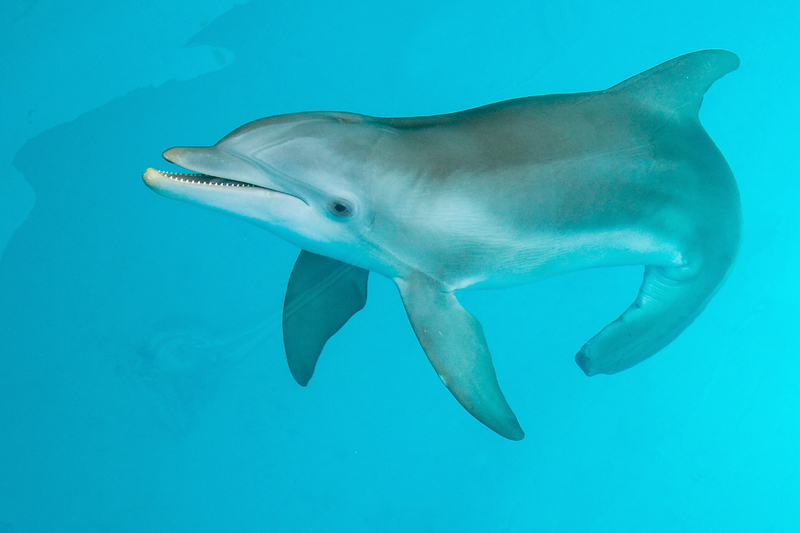 Today, Winter’s a healthy and happy dolphin!